BERLIN, Germany -- Thousands of immigrants from the former Soviet Union live in Berlin. Collectively referred to as "Russians," many are Ukrainians. Now, the conflict that began with the annexation of Crimea is catching up with them. 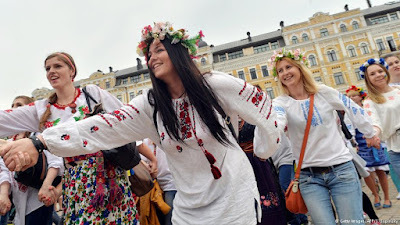 The embroidered Vyshyvanka is the traditional blouse of Ukraine. Seven years ago, Anastasia married a German, and moved with him to Berlin. She met him in Crimea, the Ukrainian peninsula that was annexed by Russia in 2014. He was vacationing there, and she was a student from Donetsk, working there for the summer. Anastasia's family still lives in Donetsk. She says her sister-in-law used to be in favor of joining Russia, but that the behavior of Russian soldiers in eastern Ukraine made her change her mind. "My father, my mother, and my brother were always against Russia, and for the new government in Kiev," she says, adding that the corruption under former Ukrainian President Viktor Yanukovych was oppressive. Anastasia met many of her Russian-speaking friends in Berlin at demonstrations held to support the pro-Western Ukrainian Maidan movement. At the same time, she says she unfriended many people on social media who branded her a fascist for her participation in the protests. Efim, who is from Odessa, says such insults can normally be traced back to Russian propaganda. He knows many Russians and Ukrainians in Berlin, and says a lot of the people he meets in bars and restaurants talk about a worldwide American-led conspiracy. "There are also Ukrainians who support Putin. If they watch Russian television morning, noon, and night, then they're just as susceptible to being brainwashed," Efim said. Just like Efim, Aljona, who comes from the Ukrainian city of Saporoshje, says she doesn't understand people from the former Soviet Union in Berlin who like Russian President Vladimir Putin. She says it's impossible to have a reasonable discussion with such "stubborn people." "They won't listen to reason, but they don't have any decent arguments themselves. They just repeat what they hear on Russian TV," said the media-studies student, who has lived in Germany for three years. She was also affected by the Maidan movement. In the spring of 2014, Aljona helped wounded Ukrainian soldiers who were being treated in Berlin hospitals. Her disappointment about the state of affairs in Ukraine today is evident. She says that reforms were approached too slowly, and that's why she doesn't wish to return to her homeland. Emil arrived in Berlin 14 years ago as a teenager from Moscow. He says he gets his news from Russian, Ukrainian, and German broadcasters. They're all guilty of propaganda in his eyes, but he says he trusts the Russian media the most. "Unlike Ukrainian media, the Russian media at least broadcasts facts," Emil said. He approves of Putin's foreign policy. He likes Russia's foreign minister, too, but describes his American counterpart as a "clown." It didn't fulfill the promises it made to the people. He has broken off contact to all his Berlin friends who share Kiev's position instead of Moscow's, arguing that it doesn't make sense to speak with people who are "overly patriotic." He added that he doesn't understand the trend toward wearing traditional Ukrainian shirts and blouses. That's "peasant clothing" in his view. He himself frequently dons a T-shirt with a Russian flag, or one that reads "Crimea is ours." He says he doesn't do it to show support for Putin, but out of protest against the "overwhelmingly pro-Ukrainian mainstream in Germany." Sergey from Moscow, however, likes traditional Ukrainian shirts. For him, they're an expression of Ukrainian national unity. He says there are plenty of Russians and Ukrainians among his acquaintances at the Berlin business school he attends. "It's not that we immediately start discussing politics, but the topic is always there in the back of your mind," he said. "You have to be very careful if you start getting into the conflict between Russia and Ukraine." Associating with Ukrainians in Berlin is something new for Sergey. He says he was surprised at the way Ukrainians identify as one people, even though they come from different parts of the country. Irina is also from Russia. She is studying international relations in Berlin. She and most of her Russian and Ukrainian friends sympathize with the Maidan movement. But unlike the Ukrainians, she says the Russians are careful about what they say on Facebook, in chats, and on Skype. "Eventually, they're going to go home, and they're afraid that they are being monitored. As long as you have a Russian passport, it's better to keep quiet," Irina said. She recently tracked down a former school friend on social media, and they talked for hours on Skype about old times. "It was only at about 3 a.m. that she dared ask me who I thought Crimea belonged to," Irina said. It emerged that her friend took part in the anti-Kremlin demonstrations on Moscow's Bolotnaya Square between December 2011 and May 2012. The two women now have a closer friendship than ever before.